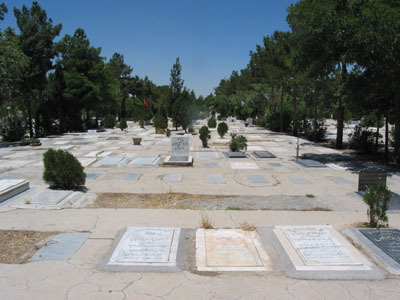 If you pay a visit to Iran after being away for many years, you'll probably have many reasons to visit Behesht Zahra, the most famous cemetery in Iran. At least we did. We felt it as our obligation to pay respect to the many family members who had passed away. So Behesht Zahra was a must see on our itinerary. 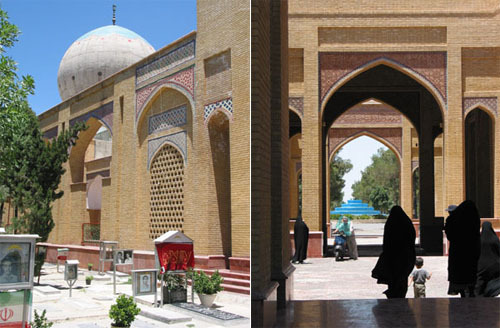 We headed to Behesht Zahra on Saturday, June 20, 2002 around noon. Behesht Zahra is located outside of Tehran on the southwest side. We could tell we are close when flower people started appearing on the side of the road. 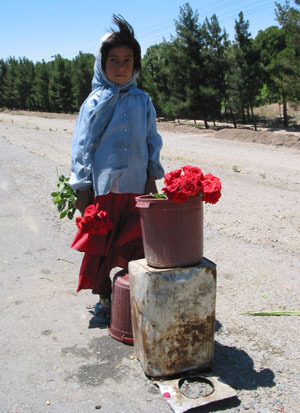 Children, men and women were holding flowers and offering it to the motorists who were headed for Behesht Zahra. We stopped by a child flower-girl and bought some flowers. I had heard many stories about Behesht Zahra being a very green and neat place. But somehow that didn't agree with the image of graveyards that I had in my mind from the past. I still expected to see lots of dirt and thought we would have to walk all over the place to find the graves we were looking for. So I was quite surprised when we entered the tree-lined streets of Behesht Zahra. And I was even more surprised when after a short drive my brother parked the car and told us the grave we were looking for was right there! It seems the dead have it a lot easier. Driving to most places in Tehran is a far more difficult task. Driving to Bazaar for example is almost like mission impossible! So perhaps this peaceful place called Behesht Zahra is well-deserved by the people who have had to struggle in the streets of Tehran all their lives! We only had to walk about 30 or so steps to get to the grave we were looking for. And soon after a child appeared there and offered to wash the grave for us. And just when she had finished, a middle-aged man appeared and started to say prayers for the dead. That was his way of earning his living. 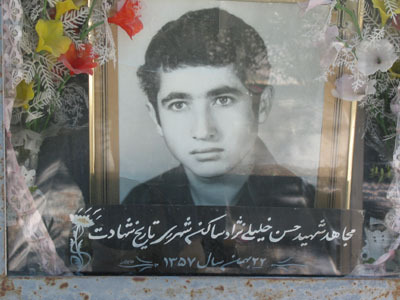 And he seemed to offer a needed service too, as most people in Iran, specially the newer generation, don't know much about the prayers, specially the ones appropriate for the dead! So it's much easier for them to let a "professional" handle the job in return for 10 cents or so. That's what we also decided to do! And so the grave was washed, the prayers were said, memories were refreshed and tears were dropped. And thus we paid our respects to all our relatives who had passed away over the many years we were away. Next we drove to the martyrs section and walked around in that area. 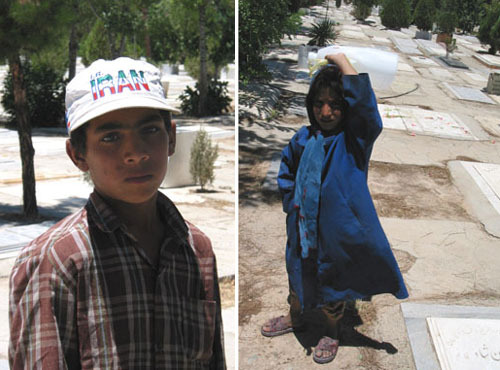 Many graves had Iran's flag hanging over them. Many also had the picture of the dead along with messages and poems. 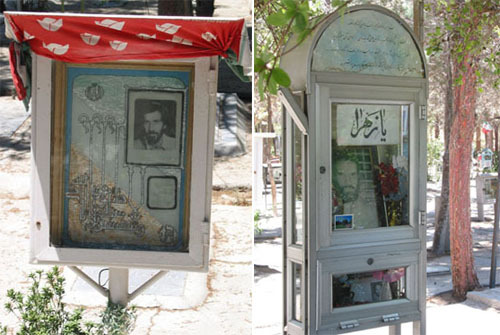 These were mostly people who had died either during the revolution or the war with Iraq. Most were young men in their early 20s. One should perhaps put aside the ideological and political beliefs and just look at these people as humans and loved ones of others. 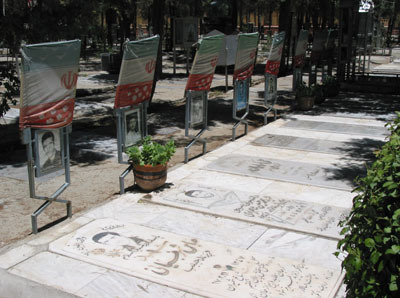 And then one cannot help but feel sorry for the sea of the dead buried in Behesht Zahra. And it's not hard to notice the causes that these people died for have also died as well, just as the flags and the pictures have faded. This is also true of the many people who died because they wanted to bring a leftist government to power. And that's of course the story of many revolutions, from Russia to China, Korea, Vietnam and elsewhere. Many people have been sacrificed in the name of this and that and then buried as martyrs. And it doesn't take long before the very ideals these people died for are also buried next to them! 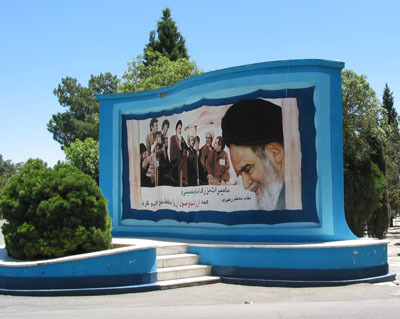 On our way out of the martyr's section, I noticed a huge poster of ayatollah Khomeini overlooking a platform about 4 feet high. 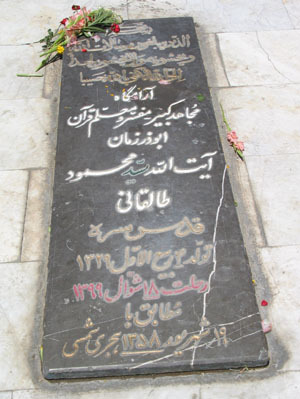 We went up the few stairs, and there lay the grave of a popular ayatollah who died in the early days of the revolution. 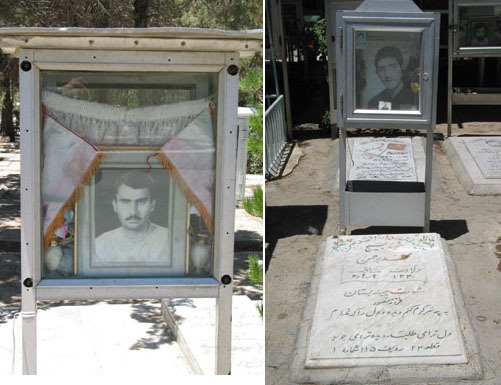 Ayatollah Talleghani's grave was simple, decorated with some flowers at the corner. We could not walk away without paying respect to him. 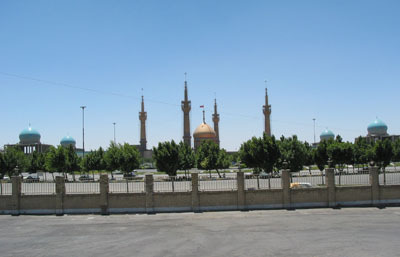 We then headed for the mausoleum of ayatollah Khomeini, which is located adjacent to Behesht Zahra. We stopped right outside to take a few shots. The mausoleum is huge. It is obvious that huge sums of money has been spent to erect it. All this for a man who said "this revolution is not for the people residing in palaces but for those residing in huts." 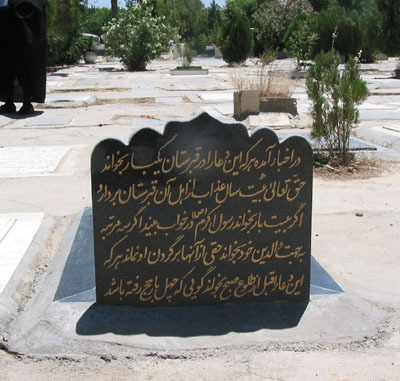 Seems like the ones who built this mausoleum didn't share those views, and perhaps they decided to bury Khomeini's ideals by erecting such a mausoleum in his honor! When we left Behesht Zahra behind, there was a sense of relief in us. 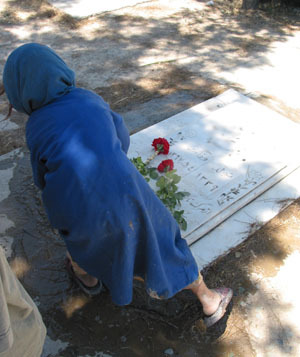 Visiting the dead is not easy, but it can perhaps do more good than harm. Our trapped emotions had finally been given a chance to escape. And on top of that, the short escape from the horrendous traffic of Tehran into quiet of the dead was in fact a blessing!